SnapGalaxy offers 100% Free online photo storage and sharing facility. We just need a valid email address. Create your SnapGalaxy account and become our fan of Facebook page to hear about discount offers and other promotions. 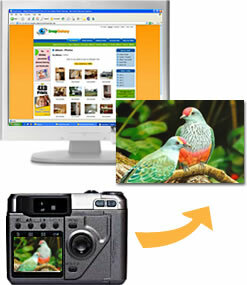 We provide unlimited online space to store your digital photos. Start utilizing it! Easy Organization & FREE Online Sharing! Create as many albums you want. Create based on category, events, places you've visited and much more. Start sharing photos with friends and family. Invite them to view your slideshow. It's easy, fun and FREE! Create your own addressbook by adding friends and family. Create groups of friends with same interest or category. Invite the whole group or an individual to view your photos. Order the prints of different sizes and it will be at your doorstep within a few days. Your friends or family can also print the photos you've shared with them.